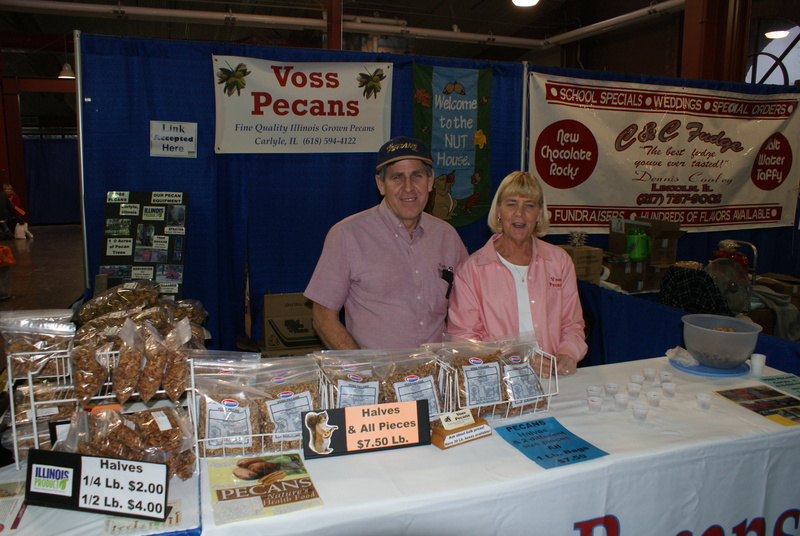 I was surprised to see a vendor at the Illinois Products Expo with pecans. Just coming home from Florida and traveling through Georgia and seeing pecan groves, I had never thought about Illinois in that light, but Ralph and Karen Voss raise 140 acres of pecans near Carlyle, Illinois. A picture of a pecan shaker was set out at their booth and I was excited to find out it was their son that had ordered a farm toy model from the talented Steve Schutlz who had one on display at the Gateway farm Toy Show the first weekend in February. Steve had entered the pecan shaker in the scratch building contest. Such a small world to meet the owners of the real pecan shaker! We took home a bag of Voss pecans and laughed over the farm and farm toy connections! More information about the pecans is available at http://www.vosspecans.com. Please stay us informed like this. Thank yyou ffor sharing.